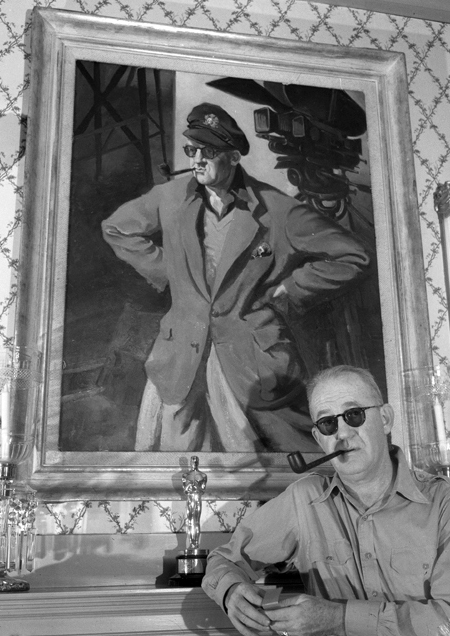 On February 1, 1894, American film director John Ford was born. John Ford is renowned both for Westerns such as Stagecoach (1939), The Searchers (1956), and The Man Who Shot Liberty Valance (1962), as well as adaptations of classic 20th-century American novels such as John Steinbeck’s The Grapes of Wrath (1940). Until today his four Academy Awards for Best Director remain a record. John Ford was born under the name John Martin Feeney as the tenth child of a Catholic-Irish immigrant family in Maine. His father came from Spiddal, the mother of the Aran Islands. Feeney attended Portland High School in Maine, where he proved himself a successful athlete. After finishing school Feeney came to Hollywood, where his older brother had already become a successful actor and director under the pseudonym Francis Ford. Like his brother Feeney also worked as an actor and also chose the pseudonym Ford. But first he chose the pseudonym Jack Ford, only in 1923 he changed his name to John Ford. 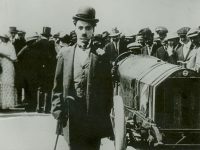 Already in 1913 Ford is said to have had his first appearance in the movie The Honor of the Regiment. The following year he played the role of Dr. Watson in A Study in Scarlet. In 1915 he had a small role as a member of the Ku Klux clan in David Wark Griffith‘s groundbreaking silent film epic The Birth of a Nation. He also appeared in at least 15 films by his brother Francis Ford, whom he also helped out as assistant director. Francis would later – when his own directing career was over – often take on supporting roles in the movies of his little brother. John Ford did his first directing for the 20-minute Western The Tornado in 1917 for the film studio Universal Studios. He also played the leading role himself. According to Ford’s statement Universal boss Carl Laemmle had given the 23-year-old the job because he could scream so well. At this early point in film history it was also quite easy to try out different tasks in film. In the first years of his career Ford shot down many smaller movies, but he was rarely mentioned as a director in the opening credits. His first feature-length film was the Western Straight Shooting starring Harry Carey, who was also a role model for John Wayne. Ford changed to the Fox Studios in 1920. His first movie here was Just Pals with Buck Jones and Helen Ferguson in the leading roles. In 1924 Ford staged the western epic The Iron Horse, which was unusually long and elaborate from the construction of the First Transcontinental Railroad and with a running time of 150 minutes. The film was shot with about 5000 extras and tens of thousands of animals in the Sierra Nevada desert. This film made Ford very famous. However, the western movie in general lost more and more viewers, which is why Ford had to switch to other genres. In 1928 he directed the drama Four Sons about the tragedy of a Bavarian family whose members fight on different sides during the First World War. The film was a box-office hit and won the Photoplay Award for Best Film. For this movie Ford was also strongly influenced by the German director Friedrich Wilhelm Murnau, who was also under contract at Fox Studios. In Four Sons a young and still unknown John Wayne had for the first time a small role in a Ford movie, the beginning of a friendship and partnership for decades. About 85 % of John Ford’s silent movies are considered lost, among them almost all early works. Already in 1928 he shot his first talkies with the thirty-minute short Napoleon’s Barber. John Ford now tried out all genres, from the adventure film The Black Watch (1929) to the submarine drama U 13 (1930) to the crime comedy Born Reckless (1930). In Ford’s comedy Up the River Spencer Tracy and Humphrey Bogart made their film debuts in 1930. In the following year Ford directed a total of three movies, whereby the literary adaptation Arrowsmith after the novel by Sinclair Lewis turned out to be especially successful and brought in four Oscar nominations. In the mid-1930s Ford was one of the most famous directors in Hollywood. He reached the height of his career in 1935 with the drama The Informer, in which Victor McLaglen played an Irish worker who betrayed his friend to the police so that he could get some money for a new beginning. This work was highly acclaimed and won a total of four Oscars, including one for John Ford in the Best Director category. In 1939 John Ford shot one of his greatest successes with the Western Stagecoach. With this extremely influential cinema classic, he made his long-time friend John Wayne a star as well as Monument Valley the backdrop. The valley with its rock towers was also to serve as an impressive setting in numerous later Ford films. Ford revitalized the western genre with Stagecoach, because before that the film studios had only produced minor and undemanding B-Western since the beginning of the 1930s. He showed the film studios that westerns could also be “intelligent, artistic, great entertainment – and profitable”. Ford won a total of four Oscars as “Best Director”: 1936 for The Informer, 1941 for The Grapes of Wrath, 1942 for How Green Was My Valley and 1953 for The Quiet Man. In addition, there were two awards for the best documentary film. He received these awards for documentaries he shot during World War II: The Battle of Midway (1942) and December 7th: The Movie (1943). During the war, Ford led the Field Photo Unit, a unit subordinate to the OSS, the predecessor of the CIA. As part of the Army’s photographic reconnaissance efforts, Ford was deployed on almost all fronts of the war: in the Pacific as well as during the Allied landings in Normandy. Ford’s films remained, at least until about 1939, relatively apolitical, romantic and oriented to the legend of the Wild West. 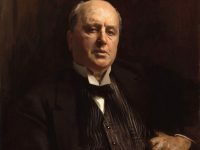 But with increasing age Ford’s films became more pessimistic, the image of the morally unbroken pioneer who had to build up a nation lost more and more importance for him. With the protagonist “Ethan Edwards” in The Searchers (1956), he created a timeless archetype of American cinema, the morally ambiguous, rushed, violent hero. In his last years Ford was dogged by declining health, largely the result of decades of heavy drinking and smoking, and exacerbated by the wounds he suffered during the Battle of Midway. 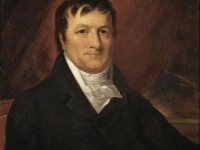 His vision in particular began to deteriorate rapidly and at one point he briefly lost his sight entirely. The Man Who Shot Liberty Valance (1962) is frequently cited as the last great film of Ford’s career. It co-starred John Wayne and James Stewart, with Vera Miles, as the inept marshal Appleyard, John Carradine and Lee Marvin in one of his first major roles as the brutal Valance, with Lee Van Cleef and Strother Martin as his henchmen. It is also notable as the film in which Wayne first used his trademark phrase “Pilgrim” (his nickname for James Stewart’s character). Ford’s health deteriorated rapidly in the early 1970s; he suffered a broken hip in 1970 which put him in a wheelchair. Ford died on 31 August 1973 at Palm Desert at age 79. Kennedy, Burt (1973). “Burt Kennedy Interviews John Ford“. In Thomas, Bob. Directors in Action: Selections from Action: the official magazine of the Directors Guild of America. Bobbs Merrill. pp. 133–37. ISBN 9780672517143.